I’ve written elsewhere on the subject of immaterial hurdles facing the argument for the basic income guarantee [µ]. I want to shortly summarize the sentiments constituting these hurdles, and outline the counter-arguments I’ve given against these views. Economist Aad Kieboom came up with the idea to introduce black flies into the urinals in the Amsterdam airport’s men’s room. Studies have found the engineering of a black fly etching into the urinal introduced a “virtuous cycle”, which ultimately reduced spillage by 80%. Could engineering a BIG, similarly, introduce a “virtuous cycle,” allowing people to escape the “poverty trap” and improve their general lot? In my prior paper, I don’t consider more fundamental hardships deriving from political conditions in any nation-state as regards introducing and legislating a basic income, though this problem, that of overarching political conditions in the modern state, poses an additional, equally immaterial, barrier to the introduction of the basic income. I think other commentators on the site, and elsewhere, in books, and on the Internet, have taken up the issue in greater detail, though, than the quick run down I have planned would allow me to give this issue. I’ve written previously mainly in regards to two particular perceptions which have implications on the movement. The first of these is that human beings are naturally lazy. This amounts most of the time to an unspoken, though underlying assumption which, in formal terms, would claim to have knowledge of human nature. Most of the theoretical basis of this is founded in the Protestant work ethic, which others have written on, particularly Max Weber, and a number of political historians, like, for instance, Michael Walzer. Let us take this issue on formally. If we look to research, there is significant evidence, based on multiple scientific studies, that suggests that human beings are not, in fact, “idleness-prone”, or “busyness-aversive”. Most research, in fact, points to the opposite conclusion. An independent study conducted by psychologists at the University of Chicago, as well as multiple studies conducted by a number of Canadian psychologists, including John Eastwood of York University concluded that there are pretty much two things that can be said of people’s inherent attitude toward work and idleness: we like the former, and the latter makes us miserable. There’s plenty of clinical evidence linking work and occupation with feelings of happiness (see, for instance, Hsee, et alia, 2010) and satisfaction, and idleness and boredom with anxiety and depression (Eastwood & Eastwood, 2009, Eastwood, et alia, 2012). People are natural doers. You’ve just got to give them some reason for picking up a task, and they’ll do it, and feel happier for it, so research seems to suggest (Hsee, 2010, 3). Radicals must, of course, keep in mind that this, at least in part, lends to the status quo ante (the “conservative” view that “if it isn’t broken, don’t fix it”), which means increased burden of proof. The conclusions drawn from the research that suggest people are happier when they do things do not seem to deviate markedly with reductions in the quality of the labor performed, or its perceived advantages by the subject. Reasons (motivations) to do an action have only to be visceral in order to justify performing an action: untie a bracelet, and tie it back, but in a different form was seen as sufficient grounds to perform an action by a majority of experimental subjects. Those who performed the “viscerally justified” action, nevertheless, felt, on the whole, a greater satisfaction, happiness, from having performed the “visceral” action than those who chose not to perform the action (Hsee, et al). This seems to suggest that radicals have a dual task of both convincing the laity that people are not lazy or “idleness prone”, and that a system based upon different social foundations can, in fact, perpetuate itself, and incur added advantages (at least weak dominance) to at least the majority of the population, if not everyone (the reasearch, by the way, seems to suggest that over the long run societies based on cooperations are more durable than those based entirely on selfishness and individualism — see, for instance, Gintis and Bowles, 2012; also, analogously, some provincial experiments at the Amsterdam airport men’s restroom facilities, which seem to’ve had added advantages for everyone involved: see image above). The second notion keeping people from supporting the basic income is the skepticism concerning people’s use of the income. If I give the homeless man on the street a dollar, he’s just going to take it and buy some liquor, right? Well, even here, empirical evidence seems to speak against this conclusion. True, at first, after the initial stimulation of more income, you get a spike in alcohol sales in places that’ve experimented with basic incomes, but that trend evens out, even in the short term. Take Namibia, for example. There was a longstanding, internationally funded experiment with a basic income in two small rural villages, and the results were overwhelmingly positive. Initial alcohol sales rose, but they evened out basically after the second payout. According to one local: “The number of shebeens (basically a pub) did not increase, in fact there were 8 shebeens before and now there are 7. We know there are many reports that the people are spending the money on alcohol instead of buying food but that is not true at all. We had a few cases when things went out of control but that only happened during the first pay-out. I would say, some people got excited about the money. After that, the [BIG] committee sat and had a meeting with the community and after that nothing serious happened again”. The initial spike would be explained by common sense. People feel more inclined towards something pure material conditions (income) prevented them from doing/having. Common sense would also lead one to believe that systems of collective punishment and mutual cooperation would prevent any serious or systematic deviation from expected norms from occuring. Our ancestral tribesmen shared game unconditionally amongst another. It was not believed, among tribesmen, that, if individuals were given meat they themselves hadn’t helped to catch, the meat would not be “appreciated”, or would wind up being buried for fertilizer, etc. The same could be said of income. Perhaps, fundamentally, a more complex phenomenon, but, in principle, the same idea applies. 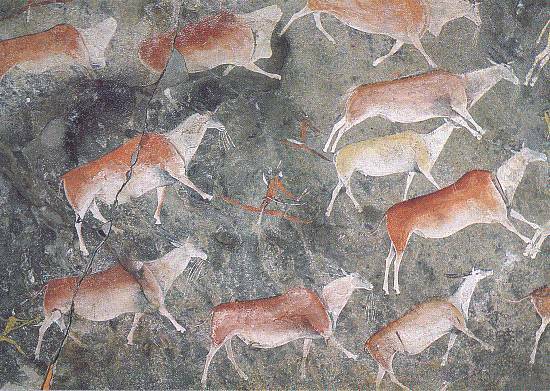 the Zaamenkomst slab, which depicts a tribe of ancestral humans hunting a herd of what appear to be a now-extinct predecessor to the eland, a savanna nomad. The curious thing is the creature, seemingly even larger than the modern eland (which itself can be up to 2,000 lbs/940 kg) would be impossible to hunt alone. This means even the primitive societies of our primordial ancestors featured an intrinsic, cooperative component. There are arguments that suggest, historically, tribes and communities based on cooperations were simply more fit for survival than their more self-serving counterparts. Is cooperation evolutionarily advantageous? Eric Fromm talked about the psychological impacts of a basic income on people. In comparing it with “a baker, who began offering sweets for free”, he came to the conclusion, as would any thinking individual — you don’t have to be an expert –, that people would initially react to this new situation by consuming much more sweets than they would have before they (the sweets) became free; but, Fromm goes on, this would eventually even out. Perhaps we can consider more practical evidence in order to disprove the notion that “unearned” income is spent frivelously. Scientific research, as well as a whole trove of empirical work studying the effects of cash-transfers in the developing world would back up the conclusion that people are generally pretty good at micromanaging, and, as Abhijit V. Banerjee in his groundbreaking book, but also others, like David Hulme and Joseph Hanlon, conclude, people just typically don’t have enough money in order to just that. In this regard, the basic income would be a “financial basis”, by means of which to extend one’s income and improve one’s standard of living. Several independently-funded experiments which tested factors like school retention rate, marriage rates and height in young, school age children in a number of places seem to back up this conclusion (see, for instance Baird, et alia, 2010; Akresh, et alia, 2013; Benhassine, et al 2012) that increased money helps increase people’s standard of living, or, alternately phrased, that people are good micromanagers, but just don’t have enough money in many cases. I’ve compared these studies in explicit detail elsewhere, and, so, won’t go into them, beyond briefly mentioning them, here. I’ve not here gone into the “moral” issue of altruism, or general concern for other members of society being a key principle in human societies, or even in social policy decisions. Others, including Milton Friedman, staunch neo-liberal economist and supporter of a basic income, have made this argument in greater detail (see, for instance, Friedman, Capitalism & Freedom, Chapter 12), so I don’t need to go into it. I hope the short outline helps sketch the basic facts that negate both intrinsic belief and long standing tradition (based on, among others, religious convention) concerning human nature as an impediment to the introduction of a BIG. It’s important, if we take the assertions seriously, to come up with definitive counter-arguments, rested in empirical evidence, which I think there’s plenty of in this case. It’s, ultimately, just a matter of both informing people of what we already know to be the case about human nature, that we’re not all lazy complaisant sloths, and, moreover, convincing them, getting information out and agitating on behalf of a fundamentally more cooperative model of society, based not on individual achievement, acquisition, “earning”, merit, but on the collective good and the utilitarian principle that ‘what is best for the most’ should be the chosen course. It’s going to take some serious steering of the ship. Perhaps a change of winds can’t hurt, either. This entry was posted in Cultural analysis, Economics and tagged basic income strategies, cooperation. Bookmark the permalink. I’ve written elsewhere on the subject of immaterial hurdles facing the argument for the basic income guarantee.